The Struve Geodetic Arc is one of the most remarkable attempts in human history to explore and determine the Earth’s shape and size. In written sources, such attempts are mentioned for the first time in the era of the famed Greek philosopher Aristotle (4th c. BCE). The radius of the earth was first determined by the Greek scientist Eratosthenes in the 2nd c. BCE. He assessed the 1 degree meridian, passing through Alexandria and Siena (currently Aswan, southern Egypt), length S and according to the formula S = 2πR 360°S calculated the value of the radius R. He calculated the meridian arc length by the speed and length of time it took caravans to cross the desert. The arc, corresponding to the difference between latitudes, was calculated based on the measured height of the Sun on the meridian. Although the accuracy of the measurements was low, the offered method for calculating the Earth’s radius was promising. It was eventually called the method of degree observation. In order to more accurately determine the radius of the Earth, more accurate geodetic measurements had to be performed. The real turning point in strengthening the methodology of the precise measurement of the Earth’s surface took place much later, in the 17th c., when the Dutch geodesist Willebrord Snellius proposed to apply the so-called triangulation method, while Isaac Newton in 1687 proved that the shape of the Earth rotating on its axis was similar to an ellipsoid. This meant that the Earth’s meridian’s curvature radius, moving from the equator to the poles, should increase. Using the triangulation method to determine the distance between the points on the Earth’s surface, they are linked into a system of triangles, the angles of triangles are measured and at least one side — the base. The Struve Geodetic Arc is a triangulation measurement chain, formed in 1816–1852, stretching from the 26° east longitude along the meridian from Hammerfest (Norway) on the shores of the Arctic Ocean to Ismail (Ukraine), by the Black Sea, i.e. from 4 °20’ to 70°40’ North latitude. The Arc covers ten states (nowadays): Norway, Sweden, Finland, Russia, Estonia, Latvia, Lithuania, Belarus, Ukraine and Moldavia. The meridian Arc length and position is calculated by the measured triangulation network fragments in the aforementioned countries. Connecting them together results in a 2,822 km-long chain, comprised of 12 sections, interspersed between astronomy points, having 10 measured bases, 258 triangles and connecting 259 triangulation points. The average length of the sides of the triangles — 27 km, but there are sides longer than even 50 km. The difference of the geographical latitudes of this chain’s end points amounts to 25°20’. Until the mid-20th c. when the satellite geodetic methods were first applied, this was the most accurately measured and longest meridian arc, for a whole century the results of its measurement were used in calculating and adjusting the parameters of the Earth’s ellipsoid. Friedrich Georg Wilhelm von Struve (1793–1864), professor of the Tartu University and the long-time head of the University’s astronomy observatory, systematised the results of the selected measurements of the fragments of the triangulation networks for calculating the meridian’s Arcand described them in a final report, Arc du Méridien de 25°20’. Based on this work by F. G. W. von Struve, in 1888 the length of the Earth’s meridian was calculated by the geodesist I. Bonsdorff. The points on the triangulation chain were monumented by laid fieldstones, bound together with limewash in the dug pit. At the top stone the hole was drilled. The hole was filled with lead and the cross was marked on it in the centre. In the north part of the Struve Geodetic Arc, the centres of the triangulation points were often marked with signs in solid rocks. 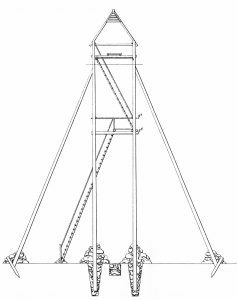 For measuring angles, wooden pyramids (triangulation towers) were built at the points; reaching up to 50 m. in some places. Optical devices were used to measure the angles between points, by means of celestial bodies the astronomical latitude and the astronomical azimuth of direction towardsthe neighboring point were determined, at the bases — the lengths of the lines. the first accurate measuring of a long segment of a meridian, helping in the establishment of the exact size and shape of the world exhibits an important step in the development of earth sciences. It is also an extraordinary example for interchange of human values in the form of scientific collaboration among scientists from different countries. It is at the same time an example for collaboration between monarchs of different powers, for scientific cause. the Struve Geodetic Arc is undoubtedly an outstanding example of technological ensemble – presenting the triangulation points of the measuring of the meridian, being the non movable and non tangible part of the measuring technology. the measuring of the arc and its results are directly associated with men wondering about his world, its shape and size. It is linked with Sir Isaac Newton’s theory that the world is not exact sphere. Although the measurements were performed in complicated conditions, the geodetic work was performed surprisingly accurately. The average angle measurement error did not reach 0.7”, while the Arc length’s accuracy was 1/232390 (4 mm per km). Although in the 19th c. the political situation was not stable, in preparing and measuring the Struve Geodetic Arc there was close scientific and cultural cooperation between the heads of the expeditions and the most skilled local scientists. The advanced geodetic and astronomical measurement theories and methods of the time were created, for these measurements instruments were invented and made, observatories were established. The Struve Geodetic Arc is commemorated and presented to public by 34 selected points. In each country, depending to the length of the arc, from one to six of the most important points are preserved: In Norway — 4, in Sweden — 4, in Finland — 6, in Russia — 2, in Estonia — 3, in Latvia — 2, in Lithuania — 3, in Belarus — 5, in Moldavia — 1, in Ukraine — 4.